Once a Transfer, Always a Transfer - Jen Pelton's Story of Impact - The Junior League of Boston, Inc. Welcome to our first ever Member Spotlight Post! We will be featuring a short interview with a new member each month, to showcase how diverse and amazing our membership base is. 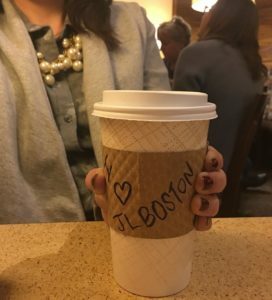 If you are interested in learning more about the Junior League of Boston, or have any questions about membership, please email membership@jlboston.org! So what exactly does a Transfer Committee Advisor do? Well, there are 6 women on the Transfer Committee. Four of us are advisors and we are each responsible for a handful of new transfers. I am essentially a buddy. I am the main point of contact for those new to the Junior League of Boston by way of another league. I answer questions about The League, life in Boston, and the like. I am also in charge of planning events to gather our transfers together and have a good time in the city I love; the one I know they will grow to love! Okay, what is your favorite thing to do in Boston then? I love sailing on the Charles (River). Do you have a Boston Bucket list? If so, what’s on it? I definitely need to get to a Bruins game. I wouldn’t mind a night out at the Boston Ballet. Oh, I really wanted to do a Duck Tour for the longest time and I finally did that this year! How did you get involved with Junior League? Well, I learned of Junior League from family friends and started with the Junior League of New Haven. I was looking to meet new people and joining the Junior League was a great way to do so. What would you say to those who are considering joining the Junior League? This is a fantastic way to meet people. I was a transfer myself, coming from New Haven, CT. The philosophy is “once a transfer, always a transfer.” Now, as a transfer legacy, I am welcomed at all of the transfer events. I have the opportunity to meet those who have just moved to the city or those who moved to Boston before me. All of the women I have met are truly wonderful. What do you do in Boston? I am an associate project manager at Houghton Mifflin Harcourt (HMH). If you didn’t have that job, what would you likely be doing? I’d probably be a high school English teacher. Makes sense. If you could have any job for one day, what would it be? What is your favorite part of the Junior League? I love going to events at Headquarters. Whether it’s a meeting or professional development, everyone is always very welcoming. I am confident when I sign up for an event, even if I don’t know anyone else there. It’s so easy to make conversation because the women of Junior League Boston as so easy to talk to. My current boss at HMH is my mentor. She created her own company/start up & HMH acquired it. I’ve known her as a peer and as a boss and she is always willing to help me navigate the industry. sneakers & M&Ms! It’s a vicious cycle, really. What has been your all-time favorite Junior League project? As a provisional, I completed a project called “Kids in the Kitchen.” It was a blast! We went into a local school, gave a talk on bone health & calcium, then made yogurt parfaits with the students. I enjoyed seeing them try various fruits & granola for the first time! This member spotlight was compiled by Communications Council member Brittany Trimble.